State institutions and banks will have access to ‘selected data’ to verify the identity of citizens when they make use of the new electronic national identity card that will replace the existing identity card introduced more than 40 years ago. Sarath Kumara, Commissioner General of the Department of Registration of Persons, said certain information on the data base would be accessible to state institutions via a network to establish the identity of holder of a new NIC, if there was a doubt. “For instance, state institutions will be able to double check the signature on the identity card by accessing the data base,” he said. One of the advantages of the new NIC system will be that even those who do not carry the NIC in person will be able to establish their identity by giving their new NIC numbers to the relevant official of any state institution, the Sunday Times learns. The official can then access the data base and verify the identity. 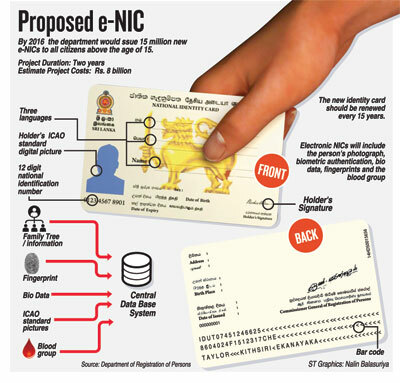 The new NIC will also make matters easy when establishing a person’s identity at polling booths and banks, when obtaining driving licences, passports, withdrawing EPF/ETF benefits, carrying out property transactions. The Commissioner General said the new NIC system would drastically reduce frauds such as drawing pensions and Samdurhi benefits by persons other than the beneficiary. However state institutions would only have access to basic information from a person’s data base. To obtain full details, the holder’s permission or a court order would be required, Mr. Kumara said. The detailed data base will include biometrics data, details of family members and whether the person is a samurdhi beneficiary or a recipient of other benefits from the state. Explaining other benefits of the new NIC, the Commissioner General said officials would be able to provide precise details about persons in an area in the case of a natural disaster such as last month’s Aranayake landslide tragedy. The new electronic NIC project due to be implemented within months will cost the Government more than Rs. 8,000 million.The funds for the project were approved by Parliament on Tuesday. Mr. Kumara said divisional secretariat staff were being trained on the issuance process of the new NIC and all Sri Lankans citizens above the age of 15 were required to obtain their new NIC by applying through their area Grama Niladhari. He said it would take at least three years to have the data base fully updated. The new identity card should be renewed every 15 years. The Commissioner General said since his department would be linked with the Registrar General’s Department’s data base, they would have access to details of births and deaths. “We will be sending messages to the parents when their children reach 15, reminding them to obtain the identity card,” he said. Any attempt to alter the identity card would be a punishable offence liable to a fine of Rs. 500,000 and/or a jail term. Civil society organisations come out strongly against the Govt.